If you are looking for a portable fridge or freezer for camping, road trips, your RV or boat we recommend the ARB 50-quart fridge freezer. It’s just as powerful as the fridge in your kitchen. 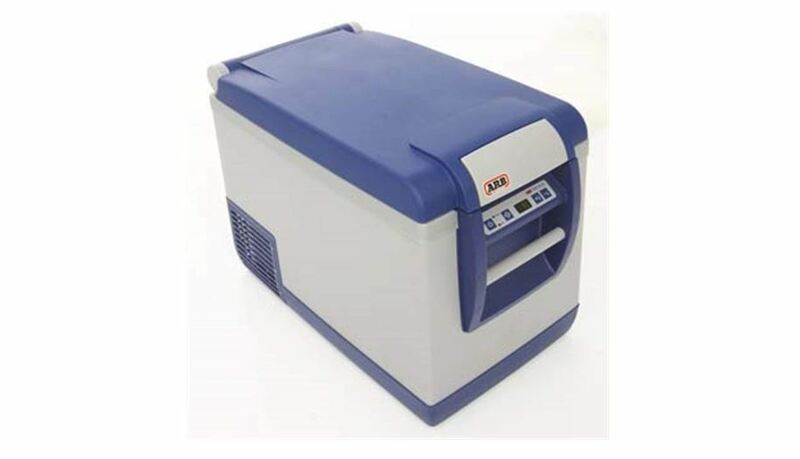 Unlike ice chests and thermoelectric coolers, the ARB freezer runs on a compressor that keeps the interior chilled regardless of the weather. It’s a great option for long road trips where you need to keep food cold or frozen for several days. It’s also great for RVs, boats and truckers. For power, the fridge plugs into your car’s cigarette lighter or any 12V outlet. You can also plug it into a standard AC outlet. Read on for our full review of the ARB 50-quart fridge freezer. If you are looking for a different type of cooler, we have more recommendations in our coolers and ice chests buying guide. Stays at the set temperature regardless of weather. No need to add ice and no risk of finding your food soggy. Comes with a separate compartment for easier organization. Includes strong handles for carrying or tie downs. Sturdy and durable–perfect for the rough and tumble of road trips and outdoor living. Battery protection system prevents your car’s battery from draining. Displayed temperature is not accurate. Takes up space – not ideal for small cars. 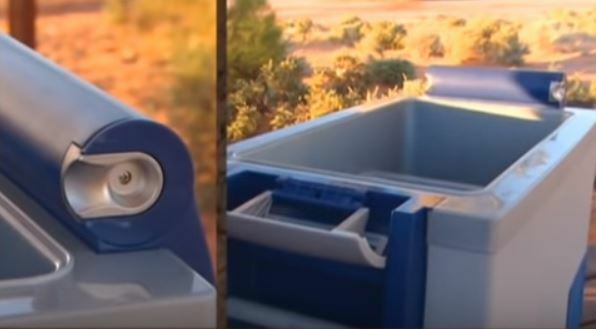 An ice chest is good and affordable but it comes with its fair share of maintenance headaches not to mention the risk of finding your sandwiches soggy. A thermoelectric cooler is easier to maintain but it’s not powerful enough for avid campers and off grid enthusiasts. 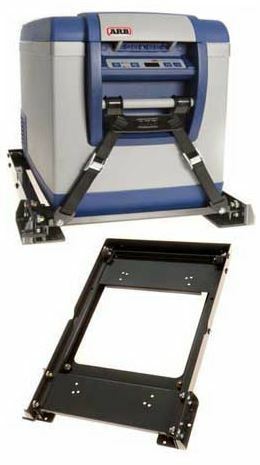 An electric portable fridge is the best option in the portable cooling business. 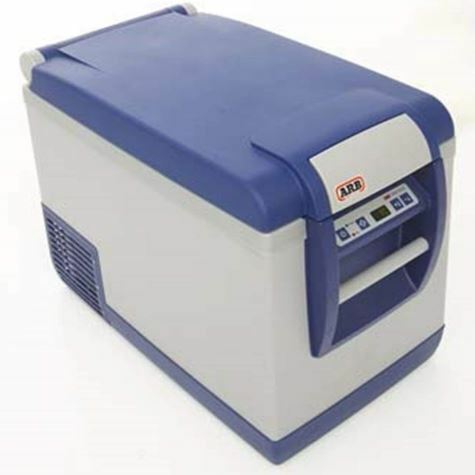 This 50-quart model from ARB is one of the best portable fridges/freezers. It can keep your drinks and food chilled or frozen regardless of ambient temperature. Whether you are on a road trip through Texas or doing some winter camping, the ARB fridge works great. The ARB fridge is powered by a compressor, similar to the fridge in your kitchen. That’s how you know it’s powerful. It can keep food chilled or frozen for however long you want as long as you keep it plugged in. But even when unplugged, the tightly sealed lid allows the interior to stay cold for several hours. The ARB is perfect for large families, groups, and individual planning to be off grid for several days. With a 50-quart capacity, it can hold several drinks and enough food to feed several people. To give you an idea of how big it is, it can hold 72 12-ounce soda cans. The spacious interior is divided into two compartments for easier organization. You can keep your drinks in one and your meat and foods in the other. The main compartment measures 13.27"D x 11.22"W x 15.79"H while the smaller one measures 5.95"D x 11.22"W x 8.11"H.
There are two ways to power the ARB fridge. When travelling or camping, use the cigarette lighter socket in your car’s trunk or the 12V outlet on your solar generator. If you are using it at home, in a hotel, in a boat or in an RV, you can also plug it into a standard AC outlet. Both the DC and AC power cables are included. You can leave the fridge plugged into your car’s 12V outlet overnight without worrying that it will drain the battery. The fridge has two features that protect your car’s battery. One, it only switches on the compressor and fan when necessary. Once the set temperature has been reached, it switches off the compressor and the lid keeps the chill inside. Two, it actively monitors your car’s battery to ensure it doesn’t drain. The fridge has two handles at the top to lift and carry it. You can also use the handles to tie it down on your truck bed or in the trunk. But as many users have noted, you don’t need to tie it down when you put it in the trunk. The fridge is remarkably stable because of its design and the rubber feet grips underneath. Even when going around sharp bends or a bumpy road, the fridge will not tip or slide. You are looking for a portable mini-fridge or freezer that will keep your food and drinks chilled or frozen for days or even weeks. You are looking for a well-made mini-fridge that can withstand frequent road trips and outdoor adventures. You are looking for a budget portable cooler.